Everyday habits, that bring us closer to nature. Habits that are good for us and the people around us. Just Natural Habits! We step on it every day, but we forget that earth is the reason that makes life possible. It holds us, it feeds us, it grows nature around us! Soil is so important for us, but instead of taking really good care of it, we spoil it and even poison it. It’s time to do something for the soil. It’s easy and we can make it, in the city, as well. It will become our favorite everyday habit. Pure some barren soil in the pot. Every day, throw in the pot any food remains from fruit and vegetables. Cover them with barren soil. Water slightly. After some months, the rotten materials will make the soil fertile and you can use it in your garden or your flower pots. Do not add many onions or citrus peels. Add especially egg shells, coffee or tea remains, ash, bird droppings, dry leaves. Be careful! Cooked food and oils are prohibited. Only then can we be happy when the people around us are happy. We embrace the vision of Wise Greece, allocating some of our profits to accomplish its social work! We actually help those who really need it. You can find us in the Wise Greece stores, in Greece and around the world. We are very enthousiastic about TILIA BEESWAX. It makes your skin feeling very soft, not only that, but also for red and painfull spots in the face, or and painfull lips in the winter. I use it as well for wrinkles. It’s a great product for all kind of skin type. I saw your product by a flight company. I bought your product a few days ago, inside the plane (amazing idea). I was impressed by the way it softened my dried hands and lips with a tiny amount. It is wonderful that you have not added any aroma and smell, only pure natural olive oil. This distinctive smell of the fresh good quality olive oil I breathe is like collecting all the benefits of the oil and making aromatherapy. I’m glad you did not give in to adding its chemical imitation to fragrance, as many other brands of ‘natural’ cosmetics make. I hope you conquer the world, you deserve it. … after a difficult period in the hospital and turning back home for the standard recovery … at the points where the hospital stickers were placed to hold the butterfly and in other places, for gauze etc. there were reddish areas … like eczematoid dermatitis with unbelievable itching … It took 3 to 4 days for your amazing beeswax, using brave amounts … At first I felt a relief … and slowly began to return to normal skin …. Thank you very much “inventors “of this magic ointment!!! I wish HEALTH for the whole world !!! I strongly suggest Tilia to everyone !! “An excellent product for the skin, and the only one able to cope with very intense dryness (on skin and lips) during treatment with isotretinoin for acne. Still, compared to another ointment I have tried a long time ago, yours were much thinner, much better texture! Conclusion: I strongly suggest Tilia to everyone !! It’s a great product and very effective! I put it almost every day on all the “problematic” points. Cracked hands, chapped lips, chapped nose from cold or cold, burns … I think it does for everything! I also received it for my friends! I highly recommend it to everyone! I will not call this product a simple ointment because it is not … It is more of a solution to almost all the skin problems I have had occasionally. For irritation from anxiety in the face, burns or even after the sun in the summer. I apply to the problematic area in the evening and until morning, the irritation has just disappeared! I do not need anything else. I highly recommend it. Someone brought it to me. Very effective. Okay! But you have to open an eshop because I can not find it easily in pharmacies. It has replaced: diaper change cream + facial cream + hand cream + cream for atopic dermatitis. I recommend it! I do not remember well how it started. Definitely in a kitchen on Delphon Street. Cans go and come, electronic scales, timers and countless trials. For months, the dosage was changing, the technique improved, but enthusiasm remained for an even better recipe for an even better technique for an even better fit. If the best is the enemy of the good, then Tilia should have had many enemies. In her little story though, only friends have done and I’m glad to be one of them. At first I was rather indifferent. I would never buy a starter – I did not even know what it is. I also had no skin problem, nor am I dealing with natural products. I probably do not trust them. From very early I had four samples that I gave to two of my friends with babies, one with dry skin and one with eczema. Everyone was telling me the best. At the same time, I began to experience other similar products, which I found in pharmacies and in bazaars. Then I realized that all these months of testing had a reason. I did not find any other 100% natural make-up that has a flawless texture and application. Postscript: And because I have to describe a personal experience, three months ago I first appeared eczema in my palms. Thanks to Tilia it did not last for more than three days. I use Tilia really at every opportunity! When my baby has some irritation, a pimples or even a mischief, she has learned what will help her and tells me, “Mom, it’s time for Tilia.” I always have it with me at work and once I get off the gloves, which I unfortunately wear daily, I open the jar to find my ally. If you forgot your Tilia Multi-Purpose Skincare and you are sailing with Celestyal Olympia, just look at the little shop inside the boat. It is waiting for you! This summer, you can find Tilia Beeswax Multi-Purpose Skin Care at Petit Tipota Beach House Concept Store, in Antiparos! Enjoy your summer safely and let TILIA be your everyday self-care ritual! Our new Tilia Beeswax Multi-Purpose Skin Care has earned the EDITOR’S CHOICE award at mama & baby Beauty Awards 2017! It is editor’s best choice, and of course your best choice, throughout the year! 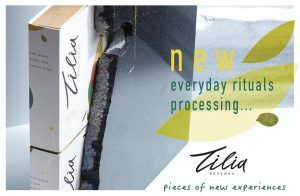 NEW TILIA BEESWAX MULTI-PURPOSE SKIN CARE!!! Our family of products grows and becomes even better. After 6 years of success, TILIA Beeswax evolves, always keeping its pure, exclusively natural ingredients (old, plus new) and high-quality packaging, that respects the environment. In addition, the new TILIA Beeswax Multi-purpose Skin Care contains all our expertise in the manufacturing process, which ensures even better skin absorption and ease of use. Order it directly from our e-shop, and have the best summer ever! If you are pregnant, don’t forget to take care of yourself using only natural products, like TILIA! You can also visit EFTOKIA in order to feel the high value of natural birth. You will find TILIA there, too. Don’t forget to ask for a free sample! On May 2016, our favorite beeswax ointment starts travelling worldwide with Aegean. Passengers will have the opportunity to buy Tilia on-board, and feel its all-natural benefits in more than a hundred places around the world! Natural beauty is always in fashion, and Tilia Beeswax supports the 19th Fashion Week Show, that takes place on April 8th -11th 2016, in Athens. Be there with the top of Greek fashion. Let this year be creative and full of art! Tilia launches a comic strip with instructions of product use, by Christos Kourtoglou! Enjoy shopping and lunch break, at a special concept store in the heart of Athens (Solonos 34, Kolonaki). Tilia is there, too! Although it’s difficult to post something optimistic on such a difficult period, on a positive note Tilia participates at the Love Natural Love Organic show in Olympia, London (3-5/7). If you happen to be there, come on and visit us! The “temple” of the most elegant and luxury cosmetics from all over the world, opened its doors to TILIA! Tilia beeswax ointment is now also available through Elenianna, an e-luxury boutique that introduces Greek Luxury & Ultra-Premium products to the world markets. Definitely a site worth visiting! We are very excited that Tilia Beeswax Ointment participates at the Natural and organic fair trade in London (13-14 April 2014, Olympia), at the stand of our UK distributor, Wood-Knit-Bee Ltd.
A great shop with a well-chosen selection of quality Greek (mainly natural) products and Tilia Beeswax Ointment among them! An amazing store in the heart of East London!